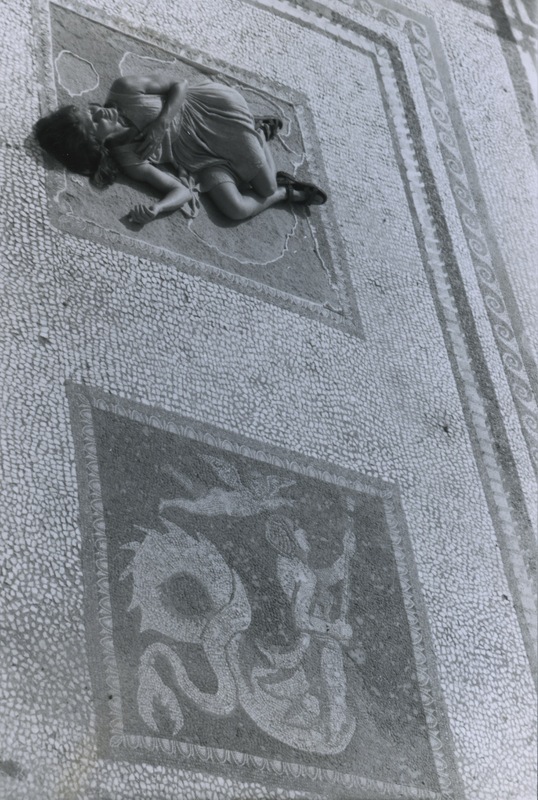 Playwright and director Sandra Kammann revisits the Greek tragedy The Eumenides, the final play in Aeschylus’ trilogy, The Oresteia, widely considered the greatest of the ancient Greek tragedies. Tracing the ancient story to its earliest known sources, her play Crack Between the Worlds: the goddess returns addresses timeless issues: the gender battle, oppression and abuse in God’s name, the manipulation of a people by their leaders, and people’s thirst for soul quenching inspiration. 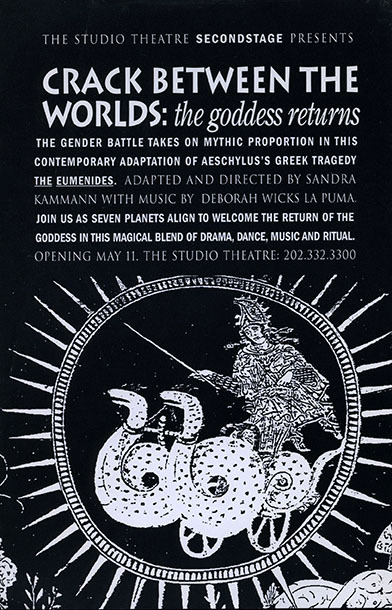 In the play, ritual and myth from the ancient matriarchal Minoan Snake Goddess culture are brought to life by the dance/theatre troupe Sisters of One Eye, Sandra Kammann, Choreographer. A chorus of Greek citizens augments Aeschylus’ original version, singing Orphic text with a score composed by Music Director Deborah Wicks LaPuma. Athena presides over Orestes’ trial in a courtroom now packed with opinionated Greek citizens, pitting young Apollo against the ancient Furies. In this adaptation, the Furies fulfill their ancient role as defenders of the matriarchy, revealing to Athena the story of Athena’s true mother, Metis. This revelation refutes Zeus’ claim of Athena’s patriarchal birth, rocking Athena’s world and transforming the future for the benefit of all. Crack Between the Worlds: the goddess returns is a rich tapestry of impassioned classical theatre, glorious choral harmonies and compelling choreography. The play reweaves lost images of women into humanity’s cultural threads, expressing the often hidden truth of women’s experiences. Origin Culminating two years of research on fellowship, including site specific work in Greece, the play was originally created by Sandra Kammann as a thesis project for a Master’s Degree in Cultural Anthropology: Performance of Transformational Theatre at The George Washington University. A laboratory version was performed at GWU’s Dorothy Betts Theatre in 1997. After further research, an expanded professional production was presented in 2000 by Studio Theatre’s Secondstage, playing to sold out houses, and receiving a Helen Hayes nomination for best musical production. Aeschylus goes feminist in “Crack Between the Worlds: the goddess returns,” adapter-director Sandra Kammann’s freewheeling take on “The Eumendies.” The feminist angle ultimately plays pretty well, gradually becoming an equal partner with Kamman’s striking production – a moveable feast through an abandoned building on 14th Street. The show is a production of Studio Theatre’s Secondstage, which has done this sort of site-specific work before…It’s a spirited, sprawling show, involving more than two dozen performers…but individual performances don’t stick with you as much as the overall whirl. “Crack Between the Worlds” is full of…ceremony, and though Kammann aggressively shapes Aeschylus to meet her needs, the result feels more inquisitive than dogmatic.